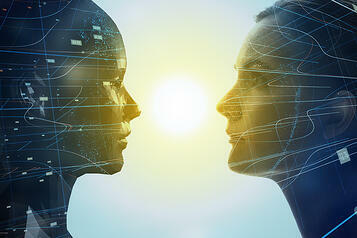 Digital twins are virtual models of real life assets or production operations. They can be powerful weapons in the emerging armory of the Industry 4.0, helping operators to spot problems, optimize performance and test proposed changes without disrupting physical operations. But digital twins face a major hurdle in terms of scalability when it comes to implementing site-wide condition monitoring to enable predictive maintenance. For many organizations, this makes an alternative approach based on machine learning far more practical and cost-effective. It’s increasingly common for OEMs to deliver critical production machinery complete with built-in self-monitoring systems. However, many manufacturers and process operators are looking to go beyond monitoring individual critical assets and deploy condition monitoring and predictive maintenance across their entire operations. Building a digital twin of an entire factory or process plant is a big challenge. Most factories and processes include a wide variety of assets that interact and impact on one another in complex ways. So creating a useful plant-wide digital twin is far beyond the ability of a ready-made, off-the-shelf solution. Instead, plant operators must invest a huge amount of time and resources upfront to create a customized model. With pressure on budgets and skills, this often means that the sums simply don’t add up. And the challenges don’t end there. A digital twin needs updating every time physical or operational changes are made to the corresponding equipment, potentially piling steep operating costs on top of the initial outlay. There is another way. A cloud-based, software-as-a-service solution using Senseye’s proprietary algorithms and machine learning can be rolled out successfully across any size of operation, becoming even more cost-effective per machine as more assets are included. Senseye can take monitoring information from existing sensors and other sources, so there’s minimal on-site disruption. It combines that with maintenance information to monitor the condition of assets and make reliable predictions about their remaining useful life (RUL) – a process known as prognostics. Once in place, Senseye’s algorithms start learning right away and take just 14 days to start delivering meaningful insight about when to carry out maintenance in order to prevent unplanned downtime. Better still, Senseye keeps on learning and becomes even more helpful over time. This approach breaks down the cost barriers that have prevented traditional condition monitoring solutions from being applied to all but the most critical assets. It’s also much more scalable and cost-effective than some of the other new Industry 4.0 approaches at delivering site-wide solutions – and that includes digital twins. Senseye may be at the leading edge but that doesn’t mean it’s unproven. Users can typically expect to enjoy a 50% reduction in unplanned machine downtime, 55% more productivity from their maintenance staff and an 85% improvement in the accuracy of their downtime forecasting.